Sometimes all the pieces just come together perfectly. 7 Men from Now is a 1956 American western film that stars Randolph Scott, Lee Marvin, and Gail Russell. It was directed by Budd Boetticher (pronounced “Betiker”) and was produced by John Wayne’s Batjac production company. Randolph Scott is one of the kings of the B-movie western. I’ve been watching a lot of his movies lately, and have found myself becoming quite a fan. He had been in movies for a long time before he spent the second half of his career on horseback, having been a clean-cut leading man in the 1930s and known just as much for light comedy roles as for chasing down banditos. A shift in Hollywood trends during the late 1940s saw Randolph Scott becoming a star in dozens of low-budget B-films and a stalwart hero of the silver screen. A brief note about B-movies: I’ve really come to value these films that played second-fiddle to big-budget studio features because they often had to overcome a whole host of limitations and almost always felt more realistic than the A-films that preceded them. B-movies flew under the radar, and had the ability to do and say things that most studios wouldn’t touch. Budd Boetticher was just as interesting in his own personal life as he was behind a camera. A huge fan of bullfighting, Boetticher decided that he wanted to become a bullfighter himself after college. He went to Mexico and put in the time to become an actual professional bullfighter of some notoriety—a remarkable feat, especially for a foreigner—and carried that love of bullfighting all his life. Once he was back in America, he directed a fictionalized account of his own experiences in Mexico with a movie called Bullfighter and the Lady for John Wayne. 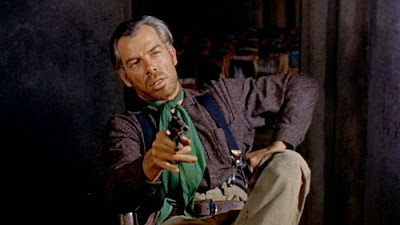 By 1956, Boetticher had established himself as a director with a unique vision and a rare style. 7 Men from Now is both the beginning and the end of several things. It marks the beginning of a partnership between Scott and Boetticher that would endure for the length of a seven-film-cycle. The seven films were called “The Ranown Cyle,” an amalgamation of Randolph Scott’s name and his production partner Harry Joe Brown’s name: Ran-Own. Almost all of the films in the cycle starred Randolph Scott, were directed by Budd Boetticher, produced by Harry Joe Brown, and written by screenwriter Burt Kennedy. 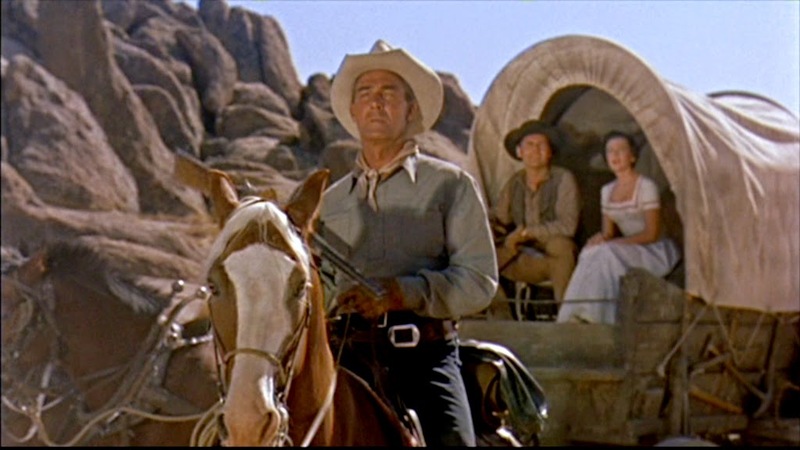 By the time the cycle ended in 1960, they had changed what the western film could say, and how it said it. If Scott had been younger, or if Boetticher hadn’t come back from Mexico, who knows what would have happened? 7 Men from Now tells the story of an ex-sheriff named Ben Stride (Scott) on the trail of seven men who were responsible for the robbery of a Wells Fargo office in the town of Silver Springs. We learn that Stride’s wife was killed during the robbery, and that he’s sworn to bring all seven of the criminals to justice. Along the way, Stride runs into a married couple (Gail Russell with her piercing blue eyes and Walter Reed with mostly normal eyes) travelling the country on their wagon; since they’re both headed in the same direction, they partner up for the journey. Finally, Stride crosses paths with Bill Masters (Lee Marvin), a man that Stride once arrested and put in jail, and Masters’ partner, Clete. Bill Masters wants the money that the criminals stole during the robbery, and he knows that if he kills all seven men, the money is his. What we have is a group of people who are all traveling in the same direction, but have very different destinations. One of this film’s major strengths is the characterization. Scott’s character is weary and weathered, and it’s very clear that he doesn’t want to be doing what he’s doing. It’s a mission of justice that he feels an obligation to carry out; he’s lost what was most dear to him, and he thinks it’s his fault. He carries a weight and a responsibility for what has happened. Lee Marvin, on the other hand, is loud and brash, but incredibly charismatic and likable. Just as Scott’s character is not entirely good, Marvin’s character is not entirely bad. They both have very fleshed-out motivations and it’s easy for us, the audience, to understand the characters in the film and why they’re driven to their actions. Another major strength of the film is the action. One scene in the middle of the film has our sheriff involved in a cat-and-mouse shootout amid the rocks of a canyon in the middle of the desert. The director uses the location to the fullest, with the characters hiding behind boulders, crawling into narrow cracks in the rock, and using every inch of the terrain to their advantage. Something else that I love about this movie is that Boetticher builds tension to a peak and then pays off that tension off screen. Without spoiling anything in the movie, sometimes we see the effects of the action rather than the action itself. Imagine two men facing off against each other. You hear the crack of gunfire, and one of them falls. You never saw a draw, never knew that bullet was coming. It’s a stylistic choice that is unconventional and helps to make the film really special. 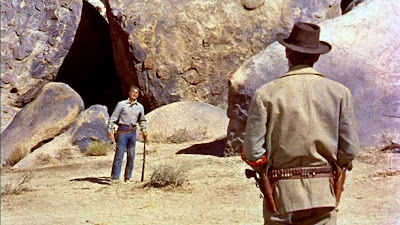 A lot of ‘50s westerns have a distinct tone and production style that links them forever to the era in which they were made, but by being so realistic and genuinely perilous, 7 Men from Now feels like it was made later than it was. 7 Men from Now shows the small tears that were starting to appear in the fabric of the traditional American western. All the forced optimism of the ‘50s was starting to wear thin. The heroes were more weathered and weary. The quests seemed somehow less noble and demanded a higher cost. The good guys still wore white hats, but they wouldn’t for much longer. 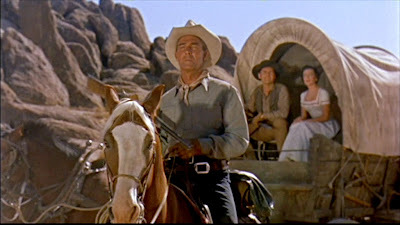 Large-scale westerns were winding down at the movies, and the genre was moving to the television; this film came out the same year as John Ford’s The Searchers (in fact, Wayne couldn’t star in 7 Men from Now as originally planned because of scheduling conflicts with John Ford’s film), and that director would only make a few more films about the west. The ‘60s were inevitably coming like a slow train over the dusty horizon and with it a whole new way of looking at the world. If westerns are a reflection of how we view our society, 7 Men from Now has a lot to say. The days of the western hero at the cinema were numbered. 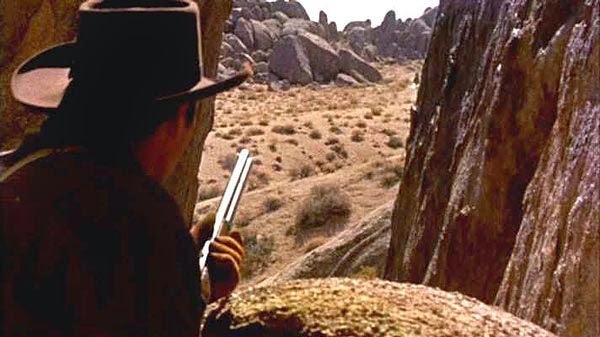 It’s interesting to note that the great western filmmakers of the ‘60s cite Budd Boetticher as a major influence. Both Sergio Leone and Sam Peckinpah tip their cowboy hats to the director, and it was films like his that paved the way for the spaghetti westerns of the next decade with their anti-heroes and ambiguous villains. 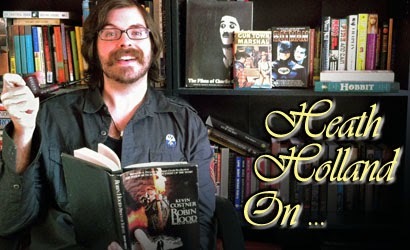 The DVD for 7 Men from Now contains a very revealing and informative documentary that runs just a little under an hour. It contains a wealth of information from people like Peter Bogdanovich, Taylor Hackford, and in what may have been the first and last time it ever happened, Clint Eastwood and Quentin Tarantino sitting next to each other in the same room discussing the films of Boetticher. The DVD is very reasonably priced, and I suggest any western fan should add it to their collection. There are six more films in the Ranown cycle, and even though they are currently out of print, I plan to write about them all. After the Ranown cycle, Randolph Scott only made one more film, finally hanging up his spurs for the last time in 1962 with Peckinpah’s Ride the High Country. That film serves as a coda not only to the films we’re talking about here, but Scott’s entire career. Meanwhile, Boetticher turned down offers from major studios and once again went south of the border to Mexico, where he pursued a passion project about a bullfighting friend that cost him both his financial and mental well-being. By the time he came back to Hollywood almost a decade later, things had changed so much that he had become an outdated relic of a time long gone. I don’t think Boetticher gets the talked about enough for being a director with an unusual, groundbreaking style, and I don’t think Randolph Scott gets credit for being a genuine action hero and someone who helped to shape the landscape of the western genre. He was a master, and 7 Men from Now reminds us why. Can't believe I'd never heard of this. It sounds like my favorite kind of Western, the ones that were made in the "square" era but were uncommonly deep in character and ahead of their time. Going to blind buy it now haha. Townspeople (hushed tones): Randolph Scott! Great write up Heath, this sounds fantastic! I went and ordered it after finishing this.